Cam Collyer, Evergreen's Executive Director of Programs, talks about how risky play and school ground design can be a benefit to kids. Risk is inherent in play and learning and yet too often risk has become equated with danger – something to be eliminated. This week the International School Grounds Alliance (ISGA), of which Evergreen is a founding member, released The Risk in Play and Learning Declaration, the first-ever statement outlining how risk-taking opportunities are an integral component of a well-functioning school ground and essential for child development. The statement is meant to encourage schools, school boards and government ministries to better balance the risks along with the benefits of risky play through the design of their school grounds as well as the type of play and learning supported there. The declaration cites research from around the globe demonstrating the benefits of risk-taking and how providing and allowing risk-taking activities promotes learning through experience. There - on the playgrounds and school grounds - is where children realize life competencies, such as common sense, problem solving, confidence, and the knowledge of one’s own abilities and limitations. ISGA members representing 38 organizations from 16 countries and six continents have endorsed the declaration. For Evergreen, the statement emphasizes the important role that school grounds play in a child’s development both inside and outside of school hours. Great places and programs to nurture our children are vital ingredients in creating flourishing cities. The statement joins a Canadian chorus (such as the Canadian Position Statement on Outdoor Play) calling for children to be playing and learning outdoors. Here at Evergreen, we have been practicing what we preach. For the past 15 years, Evergreen has supported over 5,000 Canadian schools through its national school grounds greening program and is working in partnership with 16 Canadian school boards, creating dynamic outdoor spaces and classrooms that provide students with a healthy place to play and learn and training teachers to take advantage of the power of hands-on, outdoor learning. 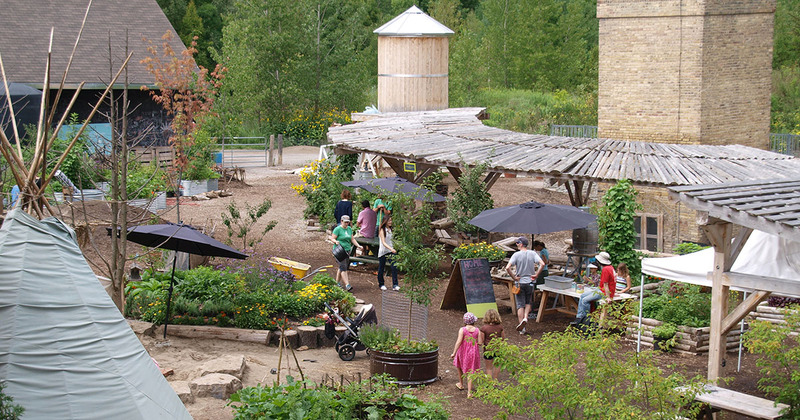 You can witness risky play in this ‘safe as necessary’ environment in the Children’s Garden at Evergreen Brick Works in Toronto. Children dart in and out of foliage, build forts with tree branches, stumps, bricks and sticks, and create their own aquaducts and fire (sometimes using sharp tools with the help of staff.) They are busily engaged in what adults call unstructured play – a great place to learn about beneficial risk! At the municipal level, children in two Kitchener parks are currently getting active and exploring nature in the local landscape through our new Neighbourhood Nature Play program. 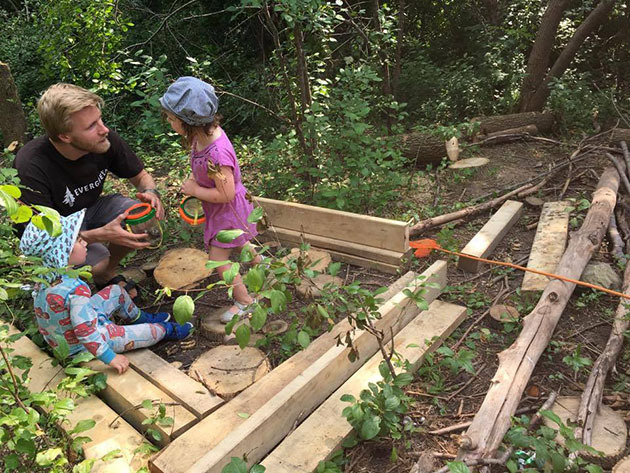 Neighbourhood kids can test their skills and abilities, experiment with loose parts, and work with hand tools and natural materials to shape their own play space. 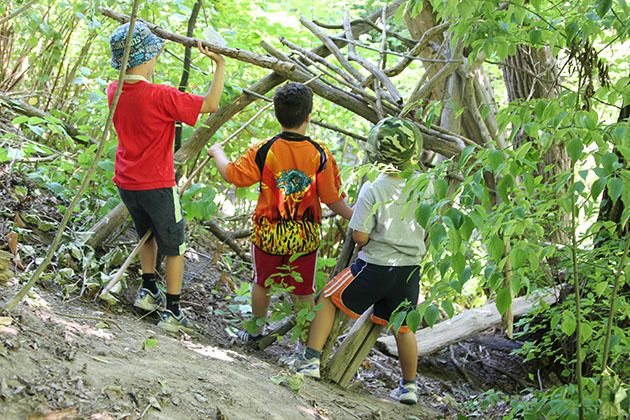 One of the favourite activities is discovering and dragging branches from felled trees, rolling the stumps and gathering sticks to construct animal habitats and build forts in the mini-forest in Gzowski Park. To be sure, taking risks can be fun and is something children are eager for as they test their limits and develop their abilities. Cam Collyer is Evergreen's Executive Director of Programs and Executive Member of the International School Ground Alliance. Celebrating winter from a local Canadian farmers perspective.